Second Day @TCS Phew! Its been a week at TCS, and I should say I enjoyed every bit @TCS. My career's first few days ought to be important to me, and I'm very glad that it went the best way it could. I'm pretty sure I'm already trying to develop the Values shared to us at TCS, and definitely improving on my Technical counterpart too. On Monday we had the General shift, i.e 8am to 6.30pm, it was the last day in which I could be at TCS with most of my friends[as I was put into the afternoon shift]. Most of us have a thought that Life at TCS can be hectic, but I should say I've enjoyed and still enjoying every moment of it. We had certain induction sessions, and Personality improvement sessions[Called BizS(Bis-skills) sessions], and an intro to what we will be doing in the 60 days of ILP. We came to know that there was a change in the ILP curriculum from our batch onwards, which was an exciting news to most of us. I should say, the Faculties at TCS ILP are very friendly and resourceful - make use of them. After the end of an tiring and awesome day, we set foot to Peepul's park again at 7am. The sessions were scheduled at 8.45 and we had plenty of time to take in breakfast. The sessions again were simply awesome! Awesome personalities and accent make us drop our jaws. Along with talks, we had Video clips regarding Safety and TCS. These sessions made us aware of the functions available at TCS and what we have to do when there is a requirement. In the afternoon we had the PAT test, which is an Objective, Online evaluation of Aspire. This test will be easy, if you have the basics right. If you have gone through Aspire, this is a piece of Cake. After the test we were again gathered for our ID distribution, everyone get a Tag, that one should wear inside the Campus. We also got our instructions for dress code. And towards the end of the day, we had our Batch allocations, and locations. We will get to know which batch we belong to, which stream we are going to follow, where our location after ILP would be, and what would be the timings of our batch. The batches are done on 2 shifts, Morning shift from 7am to 1.45pm and afternoon shift from 2.15pm to 9pm. You also get your schedules, along with instructions on which room you should be for the sessions. We had basically four Streams, and were put into it randomly, no choices and no Batch transfers were allowed. Also the Location of joining was 90% according to the choices you had given earlier. And the Sun rises on us, with a whole new career up ahead, looking bright and vibrant. All of us got ready early, the Bus was expected to arrive at 7am. All of us looked well groomed, and professional - a surprising new trend for us. A few of us had a Tie, but not many. But as the bus arrived, it started to rain cats and dogs. We had to share umbrellas to get to the bus. And surprisingly 5 minutes later, we had the bright sunshine back. Sadly, we missed a student back in the lodge of being late, and hopefully none will get into that situation. After a 40 minutes drive, we reached the Peepul's Park. We were allowed to enter the building after providing the Joining letter at the gate. Our bags had to go through an X-ray scanner and ANY electronic items(including Pen Drives) was not allowed inside. After getting into the campus, we were seated in a Hall, which had close to 260 new aspirants seated. It took sometime for everyone to be seated, and then our HR came forward and took a head count. We were allowed to have breakfast then, which I should say was AWESOME! Cheap and Healthy food was available in the Canteen - and of course the highlight was FREE Tea and Coffee! After Breakfast we had a few introductory sessions by fascinating people at TCS. And finally those days have come, the time when my life in going to take a turn to a Professional career. And I did not want anything to go wrong, and with God's grace, nothing has gone wrong yet. So after making sure I have every document as per required by TCS(via Annexure and the Welcome Mail), I set of the journey to Trivandrum from Ernakulam. Took a sleeper ticket with my friends Vineeth and Atul M, and set off the journey. Took long, but anxious 5 hours to make it to Trivandrum. And then we set foot at the Trivandrum Central Station[TVC], an overwhelming crowded station, but the nice weather came as a positive for us. We took a ticket from the Prepaid Taxi centre and started our search for Safire Lodge, Aristo Junction. The Lodge, eventhough does not look Hi-Fi, has fair enough facilities and is Clean(which is important!). Have close to 50 students at this lodge, with most of my friends at college together. We can chose our room mate, you need to have food from hotels[which apparently is not cheap], you have laundry service over here, and a Big Bazaar 15 minutes away. For Entertainment, 5 Cinemas around this place, Kovalam beach around 10kms away. The only thing hindering was that TCS campus was 18 kms away, close to 45 minutes travel. You have a bus to pick you up and drive you back, but make sure you don't miss it! Just came through an article in Mathrubhumi, and indeed an interesting one. Minister Ganesh Kumar announced this aid to the Women being abused in Theaters. And it was a simple piece of technology, if anyone get abused, they just need to send an SMS to a particular number, and the Police will arrest the culprit in less than 30 minutes. It might not be the perfect solution, but its certainly a start. With Mobile phones in every hand, I appreciate the Govt. introducing such services. Such Telephone services were activated by the Railway Police too - Read more here - Piece of info for all girls out there, This is required, maybe not in the metros and other cities where such issues are uncommon. But certainly this comes to the aid of women seeking peace in the public. Make sure you don't upload or share offensive images on Facebook or Twitter now. You might be sent to jail or fined for doing so. 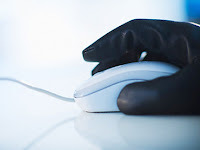 The state of Tennessee amended Tennessee Code Title 39, Chapter 17, Part 3 of its harassment law, which was previously focused on malicious person-to-person communication, to apply to anyone transmitting potentially offensive images on the web. Now that should be a lesson learnt - Facebook is a Public social network, and other can see what you say or post. This young man house in Panaji was raided by Officials of Goa Forest Department after being noticed by such an Update. WildGoa Network, a green NGO had noticed the post by Yoko Gomes, as the youth identifies himself on FB, and complained to the forest department. "We had downloaded all the content from Facebook and attached it with the complaint," said Clinton Vaz, an activist of WildGoa Network. The Indian Bullfrog is a protected species as per the wildlife protection rules and State Forest department has formed squads to crack down on poaching of frogs, which is an observed trend during during monsoons in Goa. Anonymous, all over the news for their heroic act against Sony, and now seems that the group is going to the next level. The Group recently attacked Turkey’s Telecommunications Communication Presidency (TIB), and the reason? "(The Turkish government) has blocked thousands of websites and blogs while abusive legal proceedings against online journalists persist. The government now wants to impose a new filtering system on the 22nd of August that will make it possible to keep records of all the people’s internet activity. Though it remains opaque why and how the system will be put in place, it is clear that the government is taking censorship to the next level," says Anonymous. How does Google Translate give an Interesting result on "Suresh raina is god"
Update This has been corrected by Google now, probably people might have suggested the Alternate, making Google realise the correct answer. Type "suresh raina is god "in google translator and translate it into serbian. After that copy that translated stuff and translate it back to english.. and see what happens!!!! I bet each and every Indian would be taking a look at that. When we translate Suresh Raina is God to Serbia, we get this -Суресх Раина је Бог and if we translate it back to English, we get Sachin Tendulkar is God. Ofcourse Sachin would be the obvious one with Suresh Raina, and Google Translate makes a wild guess! Also Sachin and Raina would have made a huge combination when Suresh Raina took Sachin on his shoulders after the World Cup victory. You also get an alternate choice in the translation, which will indeed help Google translate to realise the mistake. Update: Suspecting it was Angela all along, David Voelkert had gotten a notarized affidavit shortly after Jessica came online. In it, he said that he believed this was not a real person but rather his ex-wife or someone she knows. He said he was engaging with this person and lying in order to gain proof that his ex-wife was tampering with his personal life, proof he would then use himself in court. "In no way do I have plans to leave with my children or do any harm to Angela Dawn Voelkert or anyone else," he wrote above the Indiana notary's stamp. He then kept one copy and gave another to a relative for backup. Facebook is tending to be a Plot of all sorts of things. And here is a story of how Angela Voelkert came to know about her Murder Plot by her Husband. Voelkert, 29, created a fake profile of a teen named Jessica Studebaker last month, complete with a picture of an anonymous teen, and became Facebook friends with her gullible hubby, David, 38. She only had intentions to know about his dirty side, but unfortunately, it revealed much much more. David revealed to her new Teen friend about how he was planning to get rid of Voelkert and run away with the kids. To begin with, he had installed a GPS system on his Wife's van so as to keep track of her at all times. He even allegedly asked the "girl" to find a "gang-banger" at her school who would be willing to do the job for $10,000. Angry Birds, a huge hit since its launch on Chrome. It's literally being taken up by every major brand to advertise their product. The creators Rovio, have launched tons of popular toys and tshirts with Angry Birds on the flash. And now its time to cook the Egg bombs the Angry birds launch at the Pigs. Yes, Peter Vesterbacka, Rovio’s head of marketing and business development, announced the book at the Open Mobile Summit in London. Vesterbacka said Rovio’s Angry Birds cookbook will be targeted at families and include mostly egg-based recipes. The title will be self-published and likely distributed by Amazon, Apple and Barnes & Noble, in book form and as an ebook app, with Rovio banking 90% of all sales. Guess Angry Birds is going to break all realms of entertainment. Won't be surprised if I see a new Movie launching soon! Isn't the view simply spectacular? 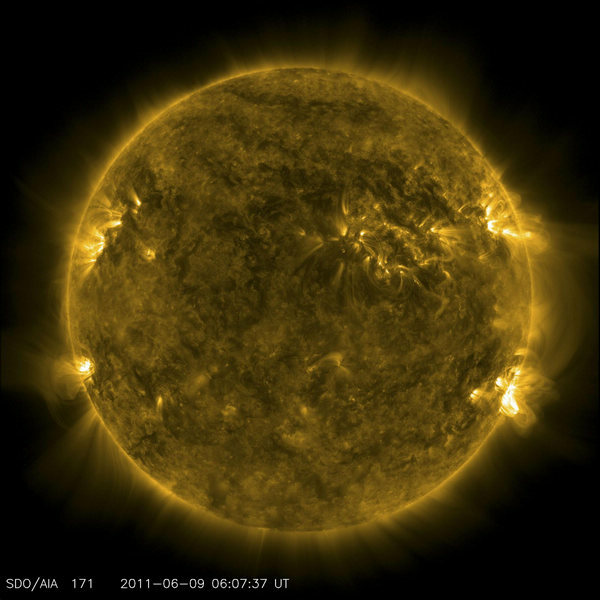 A handout picture shows the Sun as viewed by the Solar Dynamics Observatory on June 9, 2011. The sun is entering a more active phase due to peak in 2013 on a roughly 11-year sunspot cycle, the World Meteorological Organization (WMO) said. Power supplies, air traffic control, communications and satellites can all be disrupted by storms. Reminds me of the movie Knowing. "This wasn't really such a big event," said Michael Hesse, chief of the space weather laboratory at NASA's Goddard Space Flight Center. "It was spectacular to watch, but not big in terms of hazards to the Earth." The Karnataka High Court has proposed to amend the law of Age limit on Girls for marriage. The HC has proposed to keep an Age limit of 18 for arranged marriages and 21 for Love marriages. Which I believe is a very positive move to make. I should say there are thousands falling in the blind mist of love at an early age and ruining their life with a wrong partner at an age of 18. "In our opinion, the girls below the age of 21 years are not capable of forming a rational judgment as to the suitability of the boy, with whom they are in love. It is relevant to mention that those girls, who are suffering from hormonal imbalance easily fall prey to the boys and fall in love, marry and repent at leisure,” the judges quote in an order. "Since the Hindu Marriage Act does not deal with love marriages, in our view, it is high time that the Parliament take note of the sufferings of such girls and their parents and amend the law suitably,” the judges said. "I think we do have a shot at building the best office building in the world," Jobs declared in a video posted on YouTube. "I really do think architecture students will come here to see this. I think it could be that good." When Jobs unveiled Apple's plans he described the building as looking "a bit like a spaceship has landed There's not a straight piece of glass in this building, It's all curves." It will be huge and clean, Apple will switch from national grid power to an on-site energy centre using natural gas and other "cleaner", "cheaper" methods. It will comprise of a cafe that can feed 3000 at a sitting will be located within the giant doughnut. Watch the video below. Got an Offer letter from Maruti Suzuki India Ltd! Ah, what a scam. Your Resume has been selected from MONSTER.COM /NAUKRI.COM AND CLICK JOBS.COM for our new plant. The Company selected 62 candidates list for Senior Engineer, IT, Administration, Production, marketing and general service Departments. It is our pleasure to inform you that your Resume was selected as one of the 62 candidates shortlisted for the interview. The SUZUKI Company is the best Manufacturing Car Company in India; The Company is recruiting the candidates for our new plants in Delhi, Bangalore, Pune and Mumbai. Starting with Yash Raj Film's Band Baaja Baaraat, you will be able to watch movies online now on Youtube. YouTube and Intel have partnered to bring you the latest blockbusters online. Get started by visiting youtube.com/BoxOffice, along with the Movie, you get to answer Trivia questions and contests on the Channel. Users will have the option to view the movie in 720p and 1080p apart from the other standard resolutions. Deleted scenes, making of the movie and other features that are available on the movie DVD will also be available. YouTube already has a movies channel that lets you watch movies for free but this initiative by Google in India Intel will bring the big blockbuster titles to the web screen. E3 - Electronic Entertainment Expo is the Ultimate Paradise for every Gamer. And its happening now, June 7 to 9,2011, the whole Internet has been buzzing E3. With around 50 games announced, it has certainly startled me to get hold of the future of gaming, and Ive realised my Laptop is soon going to have a place in a museum! There are a few Gadgets that have caught my eye on the E3, and I bet most of them know what I'm going to say. Yes, the Playstation Vita and Wii U. Those are my choice for the best on E3, and ofcourse Apple was as interesting as it could be. Apple announced the iOS 5[Surprisingly already Jailbroken], Mac OS X Lion[with reportedly tons of new features] and the iCloud services. 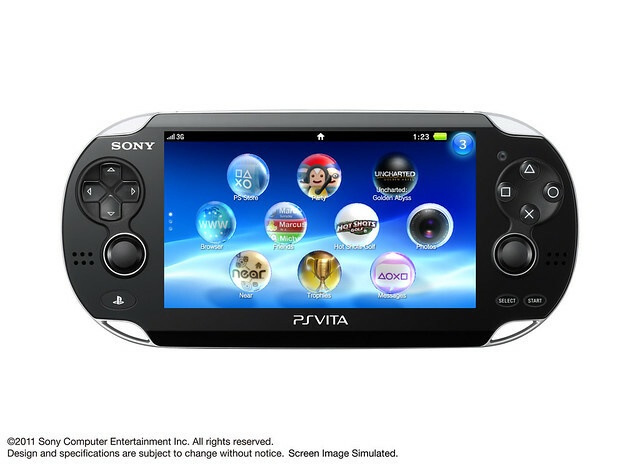 Playstation Vita, previously known as NGP, was a huge advancement from the PSP. With Dual touch layers[front and back] this certainly raises the gaming experience. In case you weren’t following the WWDC keynote coverage live, you missed well, a lot. The event — which ran about two hours — was packed with information. Thousands of articles have already been written covering some of the bigger numbers and features, so I thought I’d highlight some of the smaller things you may have missed. OS X Lion will only be available in the Mac App Store. Want a disc? Too bad, they’re extinct. Felt irritated with going to bit.ly or tinurl for shortening your Links to share on Twitter? Well no more! Twitter has introduced an automatic Link shortening recently. Now all you have to do is paster your link as such on the Tweet Box and Tweet it, the link will be shortened to 19 characters automatically. Sharing links on Twitter.com is now simple and instant. Plus, since we show a shortened version of the original link, people will know which site the link points to. This service also increases security. If users click links that are reported as malicious, we direct them to a page that warns them. The world is changing, and with its rate of growth, we need more addresses for websites. And thus introduced IPv6, and its time the world gets adapted to it. 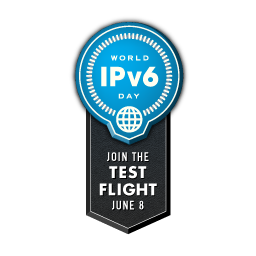 June 8th, is considered as the World IPv6 day, a day when all prominent websites including, Gmail, Google, Facebook, Youtube etc will give their test on IPv6. The Internet world have been prepping up for this day ever since, and now the day has come. Experts say the Users won't even know about the change into IPv6. The vast majority (99.95%) of people will be able to access services without interruption: either they’ll connect over IPv6, or their systems will successfully fall back to IPv4. However, as with any next-generation technology, there may be teething pains. Experts estimate that .05% of systems may fail to fall back to IPv4, so some people may find Google, Facebook, Yahoo, Bing and other participating websites slow or unresponsive on World IPv6 Day. Recently I made a post Iceland volcano of 2010, those pictures made my eyes glitter with fascination. 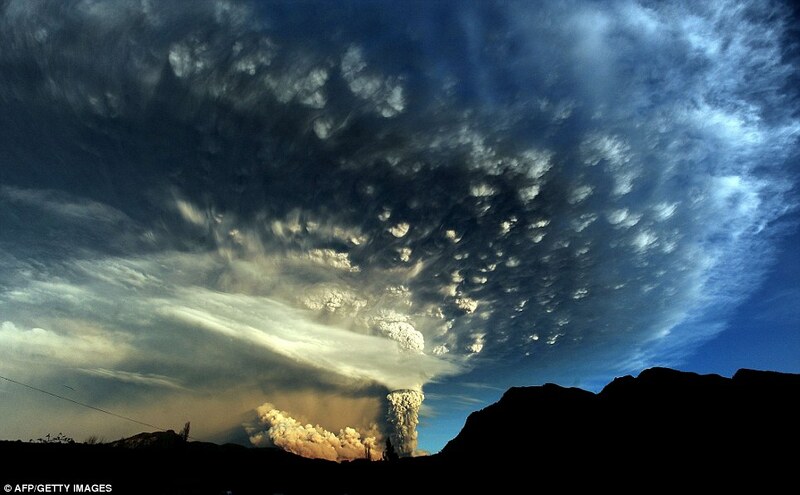 Well here is the next set of Pictures taken of the Chile Volcano. How many friends do you have on Facebook? But your Brain can only hold 150! Ha! Once I boasted of having 1000 friends, but now I realise, I know less than half of them. And here is another piece of interesting information, Robin Dunbar, a Professor of Evolutionary Anthropology at the University of Oxford claims that his studies reveal the Human Brain can only handle meaningful relationships with about 150 people. And I should say its true! 150 - a number which will be henceforth known and Dunbar's Number, is believed to be the number at which a group of people functions the best, according to Dunbar. And its true in every aspect, smaller groups tend to experience closer bonds, and affection. On Facebook, Ive been on both Huge and Small groups and I should say, even in Huge groups a very few were close to me- and those meant the Group to me. With 3 Abhishek Bachan's on the ads of Idea 3g, the quote No Idea, Get Idea is getting popular. 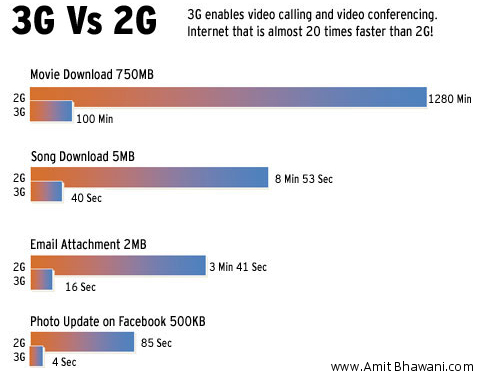 Yes, 3G is a treat to the eye, fascinating Internet Speed, Live TV, Video calling and much much more. In short, if you need a summary on how 3G will change your Internet Experience, take a look at the graph below. Now, that't not cheap, and I admit fast Internet is never cheap. Just trying to shed some light on the Customers who go blind watching the ads. To make the above stats more understandable, I would say to download a Movie, it would cost you Rs.455+. And if you go beyond the free usage, to download a song - more than 50 Rs. Now that's never cheap, I'd say better slow than pay. I had used Airtel for a while, and was happy with the service. The only defect it had was when it combined with BSNL, as for some reason BSNL SMS's never get delivered to Airtel. It was a black mark, and now National Consumer Helpline(NCH) reveals stats in which Airtel unfortunately leads. According to the reports, 2001 complaint calls were received against Bharti Airtel between March 2010 and February 2011. "Every customer complaint is important to us and we do address each of these at a customer and systemic level. However, it needs to be understood that the number of complaints referred here are a mere 0.00126 per cent of our active customer base,"
A dream come true for Indians - Argentina Vs. Venezuela on September 2nd at the Salt Lake Stadium, Kolkata. And this dream does not cost much too ! Tickets begin at a Price of Rs.1000 and range to Rs.5000, which I believe would be very less compared to the scorching glamor of the IPL. It is confirmed that Manchester City's star Carlos Tevez along with Barca's Javier Mascherano would be rolling their boots at the Salt Lake. Thanks to the Community - TCS ILP 2011 and Siva G for providing the solutions. Create tables EMP, and DEPT, the structure for which are given above. Got a chance to take out a Bike on the roads of Mumbai, never thought it would be easy, in fact I'm surprised that it was easy! I'm an amateur biker, learnt riding on my Yamaha Fazer only a year ago. But I've never tried any other bikes, and taking an unknown animal in the roads of Mumbai put a bit of scare in me. 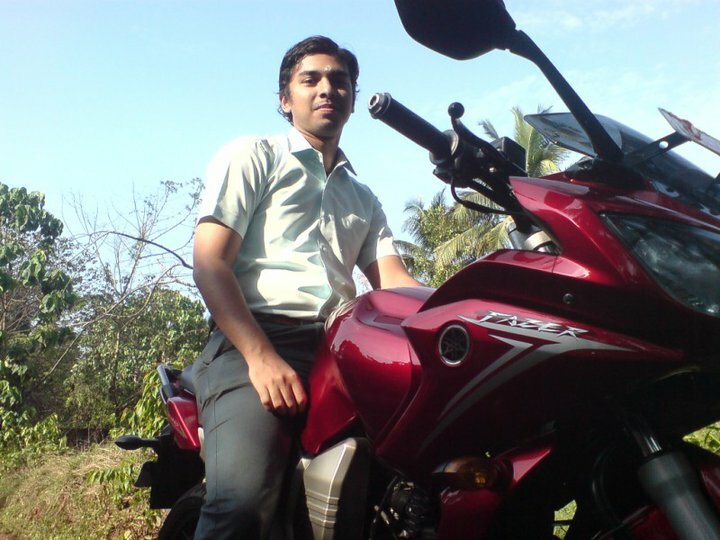 It was Bajaj Pulsar 150, and I did not even know how the Gear shift was! Neverthless, it went smooth after a slight rough start. 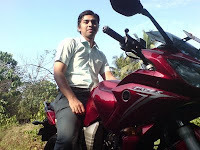 Pulsar and Fazer have totally different dimensions, and handling is totally different. Note : To all those looking up for this project, I'm putting up my version of the Portal. Please DO NOT upload it as it is. Every single statement of a Project can vary person to person. And if you are planning to upload it as it is, please keep in Mind that I'm doing a project in PHP for the first time. I had very little time to work it out and only Internet to Help. The Coding is not complete, and represents only the skeleton of the Study. However to those who are interested to know how to approach the Case Study, Please do go through the Follow and Enjoy. And I would like to have comments from a PHP Expert as well! For the past few weeks people had been happily skipping over the Courses given in Aspire, but all realised the difficulty once Aspire put up a Case Study - To develop an Online Shopping Portal. The Case study goes as follows. Facebook Birthday Party Invitation goes Viral - 15,000 Confirmed to Attend! Phew, I've never heard an invitation going so wild before. Thessa, a Teenage girl from Germany, wanted to invite her few friends on to her Birthday party. So she created an Event in Facebook, but did a small mistake - she forgot to make the Invitation as Private. This invitation spread around like a wildfire. In no time around 15,000 people confirmed to attend the Party! I'm pretty sure most of them would be using this Download Manager - IDM the best Download Manager available. It reasonably fastens download speed, and lets you download Youtube Videos as well. When watching a video, you can see a Download this Video button floating at the bottom, clicking on which will download the Video. So make sure you have Both! Google Adsense is all over Internet, and how many times do you get irritated with those ads? Previously, Google Adsense shows the ads depending on the Site content and Site owners permissions. But now Google has given this choice to the Visitor! Now you can choose what ads to appear on the page you visit. You mightve noted the change in the ads you see in Websites now. Instead of Ads by Google, now you see Adchoices. Try clicking on that, and you will get to a page that explains all about Google Ads and Adwords. In that page, on clicking Ads Preferences Manager, you get to chose the ads you wish to see. You can select a variety of Categories, which get stored in your PC as a Cookie. So begin today! Get awareness of Google Adsense, and chose the ads! Here is a video that explains it in detail. September 2010, if you ask me "Are you a Blogger? ", I'd retort - "What does that mean?". But if you ask me the Question today, I'd reply - "Yes, in and Out!" So what is Blogging? Let me explain it with an Internet Cycle. 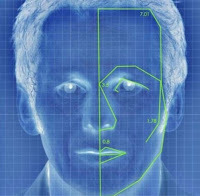 - In the beginning when you get into the world of Internet[nowadays, your entry will be on Facebook or Orkut], the first thing your thrive for is an Identity. You make up tons of friends, chat with many, Poke other, play games etc. Your mission would be to either make Maximum number of friends, or maximum number of scraps, or Rule the leaderboard. This I would put up as the First stage of the Lifecycle, which also includes getting familiar with the new world. I always watch the Programs in Discovery Channel and NGC like Mega Structures and other Engineering Marvels. Those visuals just make my jaw drop, to realise how technology has developed, how Mankind as evolved is very fascinating. But those were just visuals, Ive never seen any of those in real life. But I cam across one such wonder recently, and considering the lack of technology available in these parts of the Country, Im still wondering how this was made. With a total number of over 2,000 bridges and 91 tunnels to be built through this mountainous terrain containing many rivers, the project was the biggest and perhaps most difficult railway undertaking during this century, at least in this part of the world. After making the journey, I'm wondering how those tunnels were made. I would not be surprised if it was created in some western country. It's a part of India which is, I should say a bit inaccessible for Technology. Those tunnels stretch 5 to 7 kms, and its not one or two, as mentioned above about 91tunnel. 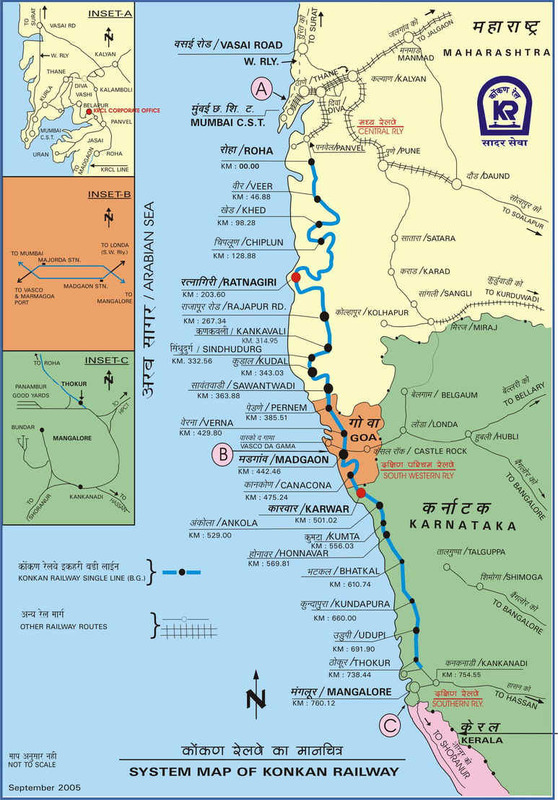 With the Konkan opening in 1998, I seriously wish some Documentary was made on how the Konkan was made a reality. It might be that Ive never noticed one, if there exists one, please share the same below. Google's +1 will hopefully prove to be the next big thing on Internet. Its Google first initiative against the Facebook "Like". Wondering what +1 is? 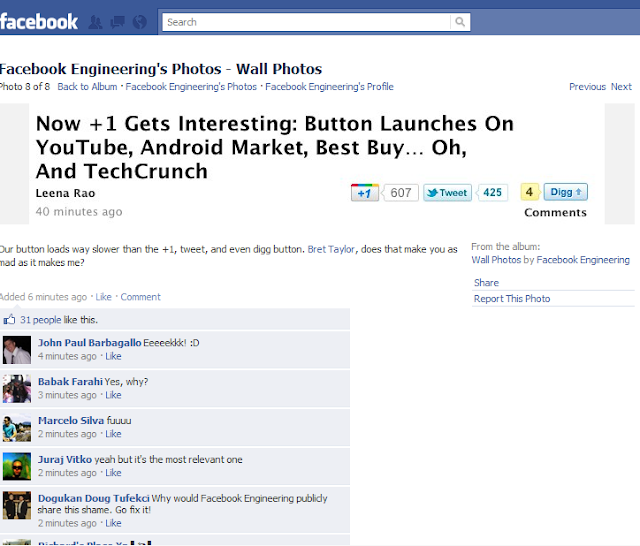 As you see a Facebook "Like" option on every site, now you can see a +1 very soon[You can find it in this blog!]. So what does +1 do? Here is an excellent video showing the functionality of +1. So how to do it? Its very easy! Follow the steps below. If you like it, +1 this! For more suggestions on Widgets, read this post! - Essential Widgets and Tweaks to your Blog. Leave a comment if you have any doubts! With Google introducing +1, Facebook Engineers feel the Heat! Yesterday, as usual I was around Facebook when I found this interesting image posted by the Official Page of Facebook Engineering. And from the look of it, I feel, the world feels, +1 has got up to Facebook. The Moderator was really going Mad! As you see in the Image posted above, the Profile of Bret Taylor who seems to be the CTO of Facebook. Either way, a note has to be put on Google +1. Google has launched +1 on several sites yesterday, including Mashable.com and I'm loving it! Certainly a sweet threat made to Facebook. Yesterday, Microsoft revealed certain features of Windows 8 at the Computex 2011. And watching the video, it gives me a feeling that in future, there would be no Desktop for Windows, and of course, Mouse and Keyboard would disappear. No shockers in that approach by Microsoft, the world is going to a Tablet world. This might also boost up the Growth of Microsoft, which went Negative for the first time. Here is the video offered by Microsoft, and a must watch for every Windows lover. 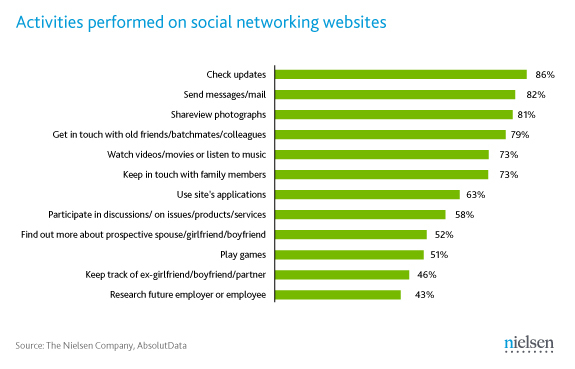 Social Networking has a huge influence on the Current society. And here is another story to prove it. 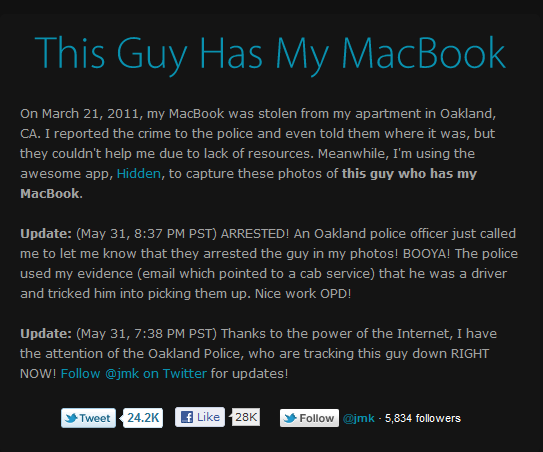 Joshua Kaufman, was pissed and angry to know his MacBook was stolen. But then what did he do? He did something clever, he was able to take photos of whoever was using his laptop Remotely- Technology at its Best! With the fury in his blood, he made a Tumblr blog - thisguyhasmymacbook.tumblr.com posting the pictures taken by the MacBook. This post had a surge of attention, within no time the Blog had 4,000 Tumblr followers, more than 20,000 Facebook likes and equal number of Tweets! 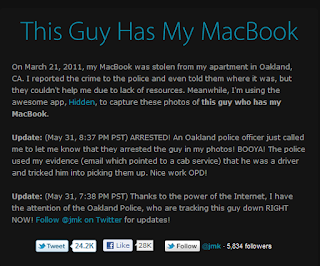 It was spreading like a wild fire.After Kaufman's blog got so much attention, Oakland police investigated and were able to nab the alleged thief within hours of looking into the case. After they learned the man in the blog post photos worked for a cab company, investigators reportedly tricked him into picking them up and arrested him. Interesting how different stats look over in the Internet. I found this recently, which clearly depicts the nature of Facebook users in the Present Generation. Based on a study which was conducted through on an online survey on a sample population of 2000 people from all walks of life spread across top five metros and Tier 1 cities in India, the following observations were made. United States the Hometown of Facebook does not even appear in the Top 20 users of Facebook. The growth of Facebook has been more than rapid, and if you wonder where these 700 millions have come, its more from Developing Countries like Brazil, India and Colombia! Seems Facebook is ruling over the world. With Facebook being such a huge success, wonder how other Social networks like Orkut and Twitter survive. Facebook is literally kicking off every possibility of having new users in other Social Networks. Personally even I almost quit Orkut, eventhough once I spend lot of time on it. Once I got into Facebook, there was no looking back. Here is an interesting stat of the Countries growth in Facebook. A mistake by the Doctor, denying enough oxygen to the baby, resulting in brain damage and Cerebral Palsy. It took 5 long years for Sumanth to take a few steps on his own, his neighbors and relatives felt sorry for him then. 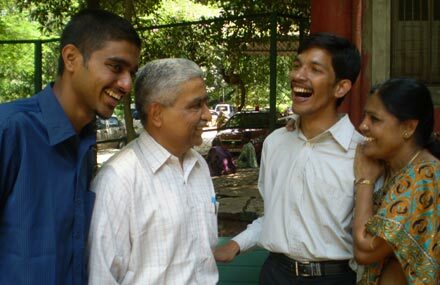 But 27 years later, each one of them would be proud to know Sumanth has got a admission in the most prestigious institutions in India, IIM- Indore. "His speech and legs were worst hit. We had admitted him to the Spastic Society of India, a rehabilitation centre for the mentally and physically challenged, when he was two-and-a-half years old. He received an excellent treatment from the school headed by Rukmini Krishnaswamy. He could barely manage to walk till he turned five," said Vasuki KS, the proud father. With the world going Digital, so has the methodologies of Attackers. And the Pentagon realizes it, by declaring Cyber Attacks as an Act of War. "If you shut down our power grid," an unnamed military official says, "maybe we will put a missile down one of your smokestacks." These drastic steps are taken by the Pentagon after a main military supplier, Lockheed Martin, was hacked earlier this month. The finding of a cyberattack as an act of war is one that "for the first time opens the door for the U.S. to respond using traditional military force." So how does Military supplement a Cyber attack? And will this guarantee the Real attacker has been punished? I don't think so, in this world, you can make up a Fake attack by an Innocent society. No big deal, and would the US fire up missiles against them? A point to think of, lets wait and see how the future crafts up. 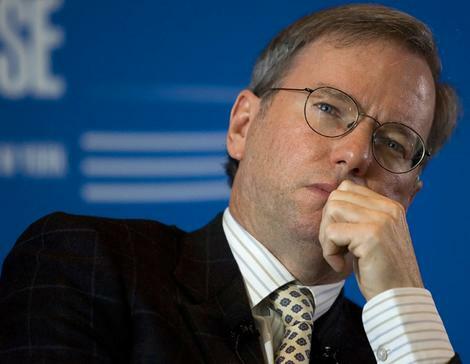 ``I screwed up,'' these words came from the former CEO of Google Eric Schmidt. And wonder why? He admits that he and other managers didn't do enough to challenge Facebook. They never thought Facebook would be such a huge hit, it was Google Win Win situation all over Internet a few years back. But now their Supremacy in Internet is being Questioned. Facebook is being the next big thing on Internet, and Microsoft are brining up innovative ideas along with Facebook as well.